My car is stuck on a rock, but it is okay: I have an idea. There is an abandoned vehicle behind me, so I get in, fire up the engine, and use it to shunt my vehicle forwards. Success! My truck is unstuck and I am ready to fight. I lay down fire on some approaching cultists with my star-spangled assault rifle in an attempt to keep them at bay. Here’s everything we know about Far Cry 5. With my assailants now hesitant, I pull out my blowtorch, and attempt to repair my ride. Instead, I set fire to a bush – my car goes up in flames, explodes, fire spreads all around me, and I am floored. But at least the rednecks go into panic, running for the hills where one of them is immediately killed by a bear. Welcome to Hope County. Fire propagation was a huge part of Far Cry 2, but Ubisoft dialled it back for the sequels – unless you were listening to Skrillex while burning up a field of weed, fire was not a massive deal. Far Cry 5 is all about the melty stuff. This slice of Montana is constantly ablaze, whether it be triggered by a stray shot catching some flammable materials, an exploding vehicle, or an incompetent buffoon with a blowtorch. In my couple of hours with the game, I see fires everywhere, and not all of them are caused by me. Hope County’s finest are constantly setting their surroundings alight, and it is hilarious. It feels alive – a world filled with idiot arsonists. That is not a criticism of the AI. 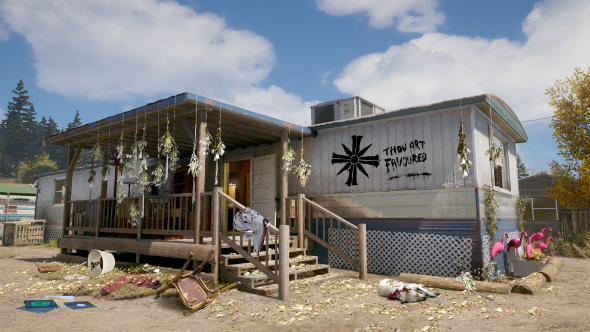 The reactivity of the world, how it whirrs on even without your involvement, is one of the best things about Far Cry 5. In a presentation given before I jumped into the game, a developer explained that we were free to liberate this demo region of Montana however we want. 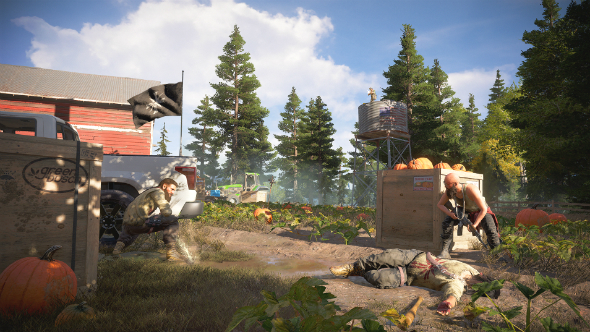 You can go in and take over compounds directly – a staple of the Far Cry series – or do other activities until the resistance builds up its strength, arms up, and rolls in to do it themselves. Make no mistake, though – this is not the reinvention you may have expected after Assassin’s Creed Origins. Far Cry, Far Cry 2, and Far Cry 3 are wildly different, but the series settled into a groove after the third game’s release, using it as a template for the two games. 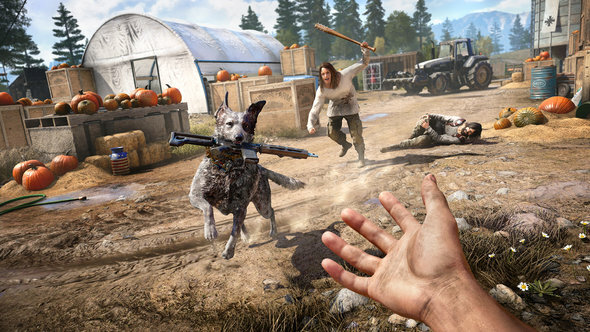 They all feel the same, and Far Cry 5 appears to follow suit, despite claims to the contrary. Structurally, however, there are divergences. Instead of revealing the world through Ubisoft’s patented towers, you talk to people and they point you to activities you can do to disrupt the Doomsday cult. Essentially, every action you complete fills a progress bar, and big story moments happen when you reach certain milestones. It is not a million miles away from Ghost Recon Wildland’s structure – you complete what are essentially side missions for a bit, then something big happens, then you are back to side missions again. You push against the cult, draw out the big names, they push back, and this presumably keeps going until you take down the leader. There are story missions you can tackle, but the one available in my demo is disappointingly unimaginative, asking me to smash ten crates in an enemy base. It could just be that this sprawling open-world shooter is a hard game to demo, but what I get is underwhelming for a story quest, though it does net me a gaudy truck to fire about in. Towers still exist, by the way, but they are called something else and have a different function. The one I tackle is a climbing puzzle filled with bee nests. At the top, I am awarded with piles of cash, crafting materials, and ammunition, rather than unlocking map locations. Once I have grabbed it all, I am free to simply jump off and open my parachute to land safely below. You can still do all the extreme sports of the previous games – wingsuiting, parachuting, and free-falling across Hope County – but now you can also commandeer planes and proper helicopters. Add in the fact that the entire game is playable in co-op, and it is potentially quite the sandbox for messing about in. One of my favourite things to do is get really high in a plane [erm, you mean in terms of altitude, right? – ed] and jump out without using my chute, instead landing in a river or lake. Outside of this, there are hunts, fishing activities, races, and the usual dizzying assortment of things to do in a Ubisoft open-world game. The most memorable moment I took part in was hunting down a moose that had been spiked with drugs. Yes. The moose had demon eyes, was surrounded by smoke, and kept disappearing and multiplying. I did not know what was happening, but I think I liked it. You can also hire dogs. 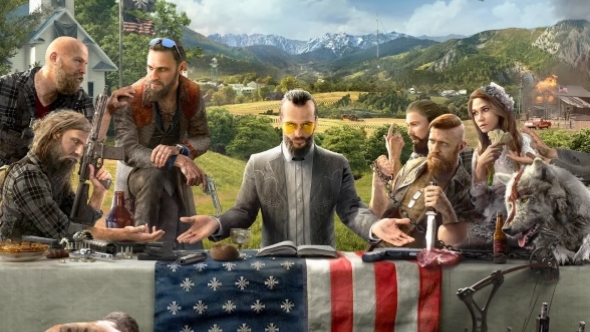 After playing it for a bit, I can kind of see why Ubisoft have downplayed the politics within this story of religious extremists in modern America. I don’t think it has been done because they are scared of upsetting people. I think it is because Far Cry 5 is nowhere near as serious as people are expecting, so they are essentially prepping our expectations. It would seem that they are not going into it thirsty for a grand commentary on contemporary America. Instead, Far Cry 5 is best summed up by a bizarre trek through a forest and gunning down a drug moose.